Ultra Reception Seating, a modular box reception range upholstered in a choice of anti-bacterial vinyls or fabrics. The seating is ideal in healthcare settings including reception areas, doctor's surgery waiting rooms, and other medical environments. The units come in a choice of waterproofed fabrics only (they cannot be upholstered in vinyl) containing anti-bacterial and anti-microbial agents, which are designed for use in high risk infection control areas. 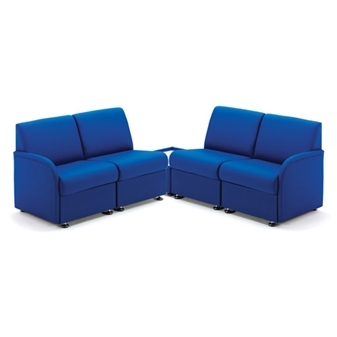 The single unit is available with no arms, or with a left or right arm, to enable a suite of chairs to be put together. A matching upholstered box reception coffee table is also available if you are creating a suite. The units come with a 5 year guarantee.